In one week, I’ll be running through the infamous Wellesley Scream Tunnel, taking on the hills in Newton, and sprinting down Boylston Street. I can’t believe it’s only a week away. My confidence is in a better place. My legs are reaping the benefits of the taper (40 miles last week). Gotta get there first though! I was joking with a friend last night – with what happened two years ago on the Friday before the race – anything could stop me from getting there. Paranoia is in full effect! My body still has 7 days to do something weird! Ha, joking of course. I just can’t wait to get to Boston and feel the magic. Minus Cabo, of course :) She just wanted to pose in the photo. 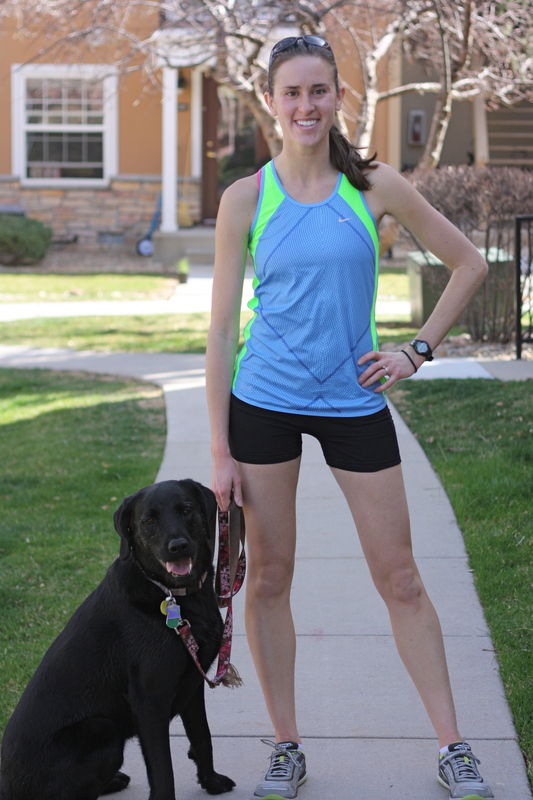 I’ve run a lot of my long runs in this outfit and it’s proven chafe-free: my old xc racing buns/shorts, Nike tank, Native sunglasses, and of course my favorite Altra Intuitions. I’ll bring a shlue of throw-away clothes for before the start. And depending on the temps, I might run in a long sleeve for the first few miles. Weez read Nate Silver’s book The Signal and the Noise, so he’s got me convinced that weather predictions farther than 5 days out are unreliable. So I’m not taking Boston’s forecast for real yet. I won’t get curious till later in the week. Do you debate with yourself a lot about what to wear on race-day? You look fast! :) Get it girl! Will Weez record some of it?! Please? RECORD!!! Yep! I’ll literally toss them to the side at the starting line (or if I’m running, to side of the course)! Marathon directors know runners do this, so they have volunteers sweep the first few miles of the course to collect to clothes, which are then donated! I’m memorizing your outfit on the off-chance I get to see you/”meet” you as you whirl by the mile 7 water stop!! Yay!! Do you happen to know which side of the road you’ll be on (north or south) and/or what color shirt you’ll be wearing? I’ll try to keep an eye out for you too! Um, hello, Ms. Running Model! You look really fast, and very fit. Good luck in the big run. Take lots of different running outfits, not just the one you have on. You never know what Boston weather will be! Well, there was the pink arm warmers, Philly, 2010.